Droughts, lengthy hot spells, heavy downpours, floods, and other extreme weather events are occurring more frequently and intensely every year. Around the world, research teams are analyzing these trends, noting the changes in temperature, rainfall, ice mass, sea level, and many other variables recorded by weather measuring devices. The trends are undeniable: the Earth is getting warmer. Polar sea ice and glaciers are melting, the sea level is rising, and as the oceans absorb more and more carbon dioxide (CO2), they are becoming measurably more acidic. Why is this happening? What is the cause of all this global warming? 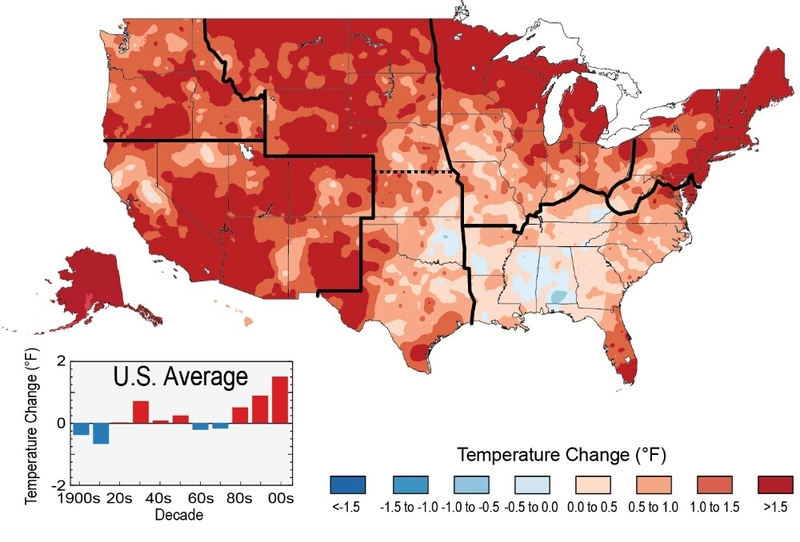 Compiled by a team of over 300 experts from the most recent accumulation of data over three years, the 2014 National Climate Assessment (NCA), Climate Change Impacts in the United States, was required by Congress to provide clear answers to these important questions. Overseen by a Federal Advisory Committee of 60 members, the 2014 NCA report is able to help us see what is actually happening to our environment. With a comprehensive federal assessment of global warming, all levels of private and public decision-making can be better informed and equipped for effectively shaping future policy. 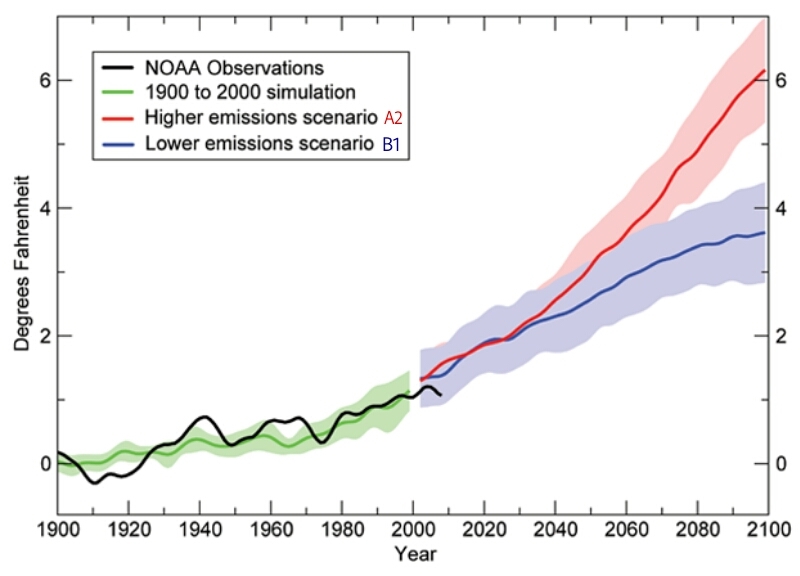 The assessment clearly outlines what effect global warming is already having on our lives, our livelihoods, and our future. Interestingly, the 2014 NCA reported that satellite sensors measuring the sun’s output over the past 50 years have recorded no overall increase in the sun’s output. This clearly proves that the sun is not responsible for global warming. Other natural factors, such as volcanoes erupting, were also clearly not the cause. For example, the huge 1991 volcanic eruption of Mount Pinatubo resulted in a short cooling effect. In fact, after separating out natural factors, the 2014 NCA reported that slightly cooler global temperatures might have otherwise been the case, if human activities had not been detrimentally affecting the earth over the past 50 years. Mostly consisting of water vapor, the atmosphere is a natural layer blanketing the earth and creating what is known as the “greenhouse effect.” Normally protecting the planet from temperature extremes, when heat-trapping gasses accumulate in the atmosphere this creates an unnatural “expansion” of the greenhouse effect. The result is global warming. 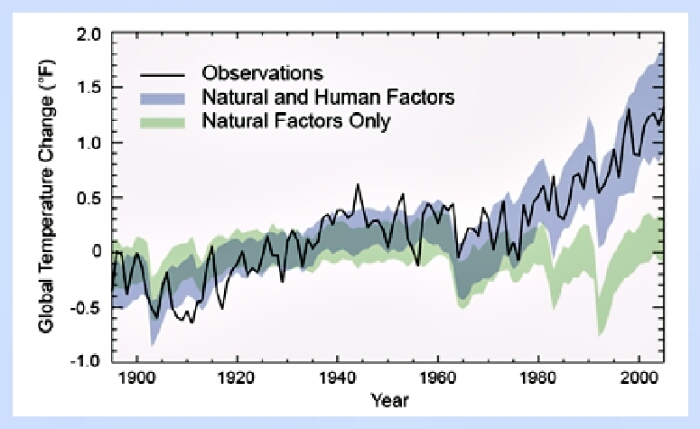 As reported in the 2014 NCA, “Only with the inclusion of human influences can models reproduce the observed temperature changes.” Over approximately the past 100 years, the burning of fossil fuels such as oil, gasoline, and coal has increased the concentration of carbon dioxide in Earth’s atmosphere. CO2 is the chemical result of the burning process which occurs when carbon is introduced into oxygen. To a lesser degree, agricultural practices also contribute to methane emissions, which are far more long-lived in the atmosphere, but are far less abundant than CO2 emissions. Nitrous oxide and Chlorofluorocarbons (CFCs) also contribute in a lesser degree to trapping the heat in Earth’s atmosphere. ● Primarily human-induced, the global warming of the past 50 years is due to accumulating heat-trapping gases in the atmosphere from the burning of fossil fuels. ● Ocean waters are becoming warmer and more acidic due to absorption of CO2, broadly affecting ocean circulation, chemistry, ecosystems, distribution, and abundance of marine life. ● Earth’s ecosystems, such as forests, barrier beaches, and wetlands, and the biodiversity within them are being impacted, notably in the timing of critical biological events like spring budding, by extreme weather events, and substantial range shifting of many species. ● Longer frost-free periods for plant growth can increase the growth of beneficial plants, as well as ragweed. Some fruit-bearing trees will be impacted by the loss of frost days, as fruit production is often dependent on a tree receiving a specific number of frost days during dormancy. ● Damage to U.S. infrastructure includes roads, buildings, industrial facilities, ports and coastal military installations, rail lines, and airport runways, due to increasing heat, sea level rise, storm surge, and heavy downpours, and is projected to increase with continued climate change. ● Extreme heat, drought, disease, and heavy downpours are causing increasing impacts on crops and livestock, possibly diminishing future food supply security. ● Impacts on ecosystems and livelihoods pertaining to water supply reliability and quality due to heavy flooding are expected to increase. ● Increased heat and reduced moisture due to drought conditions are expected to lead to earlier and longer wildfire seasons. ● Fatalities and illness are expected to increase as a result of increased wildfires, decreased air quality, and diseases transmitted by insects, food, and water. ● Climate change impacts indigenous peoples’ health, well-being, and traditional ways of life, due to loss of ancestral homelands, traditional food supplies, decreased water quality, and increasing exposure to health and safety hazards. ● Rising temperatures and increased extreme weather events are already affecting societies and the environment across the nation. Children, the elderly, the sick, the poor, and nature are especially vulnerable. 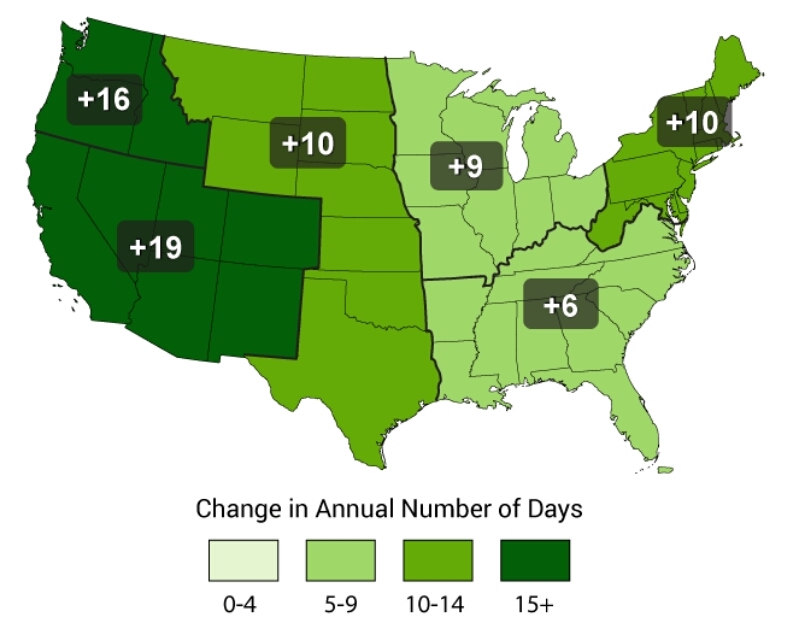 Image Notes: Global Warming Observed in US Temperature Rise. 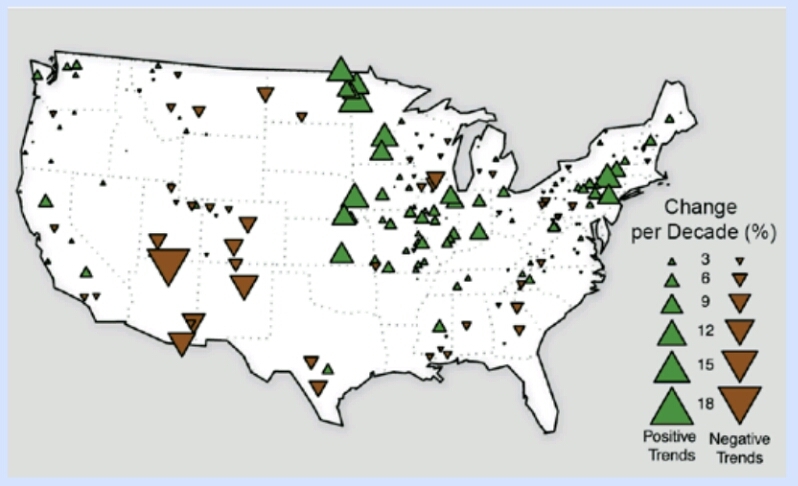 Climates vary naturally, so rising temperatures are not distributed evenly across the nation or over time. However, since 1985 the US average temperature has increased by 1.3°F to 1.9°F, and most of the temperature increase has occurred only since 1970. Additionally, the most recent decade was the warmest on US record. ● The accumulation of heat-trapping gasses already in the atmosphere has committed life on Earth to a hotter future with more climate-related impacts over the next few decades. The primary focus of the 2014 NCA is on identifying the specific and dangerous impacts of global warming in the United States. However, the report also outlines a broad range of steps being studied to reduce the current speed of global warming. Actions to reduce heat-trapping gas emissions, increase carbon uptake, adapt to a changing climate, and increase resilience to climate impacts are all steps in the right direction. All across society, fossil fuel divestment campaigns are making great strides and seeing great success. Visionary strategies, innovative technologies, and enlightened government policies are leading to more efficient production and increased use of clean, renewable energy sources, such as solar, wind, and geothermal power. Combined with efficient battery storage, all of these clean energy technologies are helping us to correct our course away from deadly fossil fuels. Between now and the next couple of decades, the choices we make about fossil fuel emissions will have a significant impact on global warming. It is the future of all life on Earth, not just the human race, that is at stake. But it is only the human race that is responsible for the mess we’ve made of the planet, and we are the ones who must now work together to fix it.